This is part of a series in which Americans age 50-plus profile their adopted overseas locales. Send us your suggestions at encore@wsj.com. Each new day in this nearly 500-year-old city is greeted with a symphony of crowing roosters, the clippity-clop of horse-drawn carriages, and barking dogs. My wife and I moved here, to Granada, Nicaragua, three years ago after living in Costa Rica for two years. Located on the northern shore of Lake Nicaragua, Granada is a flat city of narrow streets and endless, brightly colored walls, some of which are hundreds of years old. These walls are interspersed with occasional doors, some fancy, some plain, behind which can be anything from a palace to an earthen-floored shack. Often referred to as the "City of Doors," Granada is a wonderful town for walking and bicycling, as it features restaurants, shops and markets down every street. Our decision to move to Central America in 2008 was tied in large part to health care. We retired when we were both 62, but Medicare isn't available until age 65. Therefore, we decided to leave the U.S. during this gap and seek good, affordable health care in a new environment. Costa Rica certainly qualified in that regard, but Nicaragua has turned out to be even better. We chose Granada because of its beauty and proximity to the highly regarded Hospital Metropolitano Vivian Pellas, about 45 minutes away on the outskirts of Managua. Health care here is as good as, if not better than, anything we had in our native Tennessee—and a fraction of the cost. All that said, we didn't take our move here lightly. 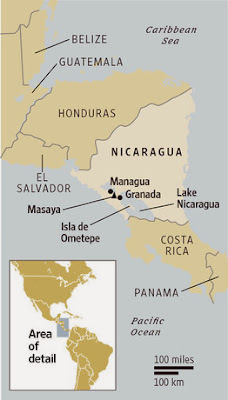 Like many others, we initially envisioned Nicaragua as war-torn, desolate and dangerous. The reality is something quite different. The list of pleasant discoveries would begin with the people, some of the friendliest we've encountered anywhere. For the most part, the locals have met the gradual influx of expats, especially retirees, with open arms. Many are aware of the boon to the economy that we represent, and are tolerant of our feeble attempts at Spanish. Many of them speak good English, besides. Language, thankfully, hasn't been much of an issue. With the exception of electricity and gasoline, expenses here are remarkably low. A good haircut can be had for about $2, and a filet mignon dinner at one of the nicer restaurants will cost about $10. Taxis will take you from one end of town to the other for 45 cents (we don't own a car), and a cold beer will run less than a dollar. We rent a nice apartment that includes a swimming pool, pavilion and a garden filled with fruit trees. (Bananas, mangoes, avocados, lemons and coconuts are available for the picking when in season.) Our monthly budget—which includes rent, utilities, food, medications and miscellaneous items—is about $1,800. For those who want something more permanent, property is readily available and easily bought. A typical day for us might include visits and meals with friends, excursions to nearby attractions, attendance at any number of cultural happenings, baseball games, leisurely walks or simply enjoying our home. Getting back to health care, we pay out of pocket for all services and medications. Fees are about 20% to 30% of what they would be in the U.S. For instance, an office visit to our doctor is $15, and we get his undivided attention for as long as it takes. (He even makes house calls for the same price.) Vivian Pellas hospital accepts several international insurance plans (but not Medicare) and offers two discount plans of its own that, depending on one's age, offer considerable savings. We often are asked about safety and security. We use common sense and feel comfortable wandering the city's streets at most any time. The prevailing wisdom is to carry little money, wear no expensive jewelry and use taxis to get around after 9 p.m. Until that hour, most families have their rocking chairs by the sidewalks after dinner to visit with neighbors and enjoy the evening breeze. The major drawback for us is the heat. Nicaragua has only two seasons, wet and dry, and the temperatures can be oppressive during both. The rainy season runs from mid-May until mid-December and offers little relief. Then there is the poverty. Only Haiti is poorer among Latin American countries. Nicaragua has a massive lower class—probably over half the population—and very little seems to get done by the government to benefit the poor. A goodly portion of Carol's and my retirement funds go to local charities. Lastly, Nicaraguans are notoriously indifferent to timetables. A workman scheduled to appear at noon might, in fact, appear at noon. Or he might appear tomorrow. Or next Tuesday. Or not at all. Patience is a virtue. We haven't been back to the States since we left and have no plans to go soon. We have had several stateside friends visit, and have received promises from several others. As we tell them all: "Come on down. The beer's cold, and the door's always open." Mr. Lynch lives in Granada, Nicaragua. Email him at encore@wsj.com .